The U.S. Constitution is a fortress built by the Founders around the American people and is the country’s only defense against the internal destructive forces of evil, Barack Obama and his leftist comrades. To realize their dream of defeating America and having their way with its citizens, they must destroy that constitutional wall of protection. 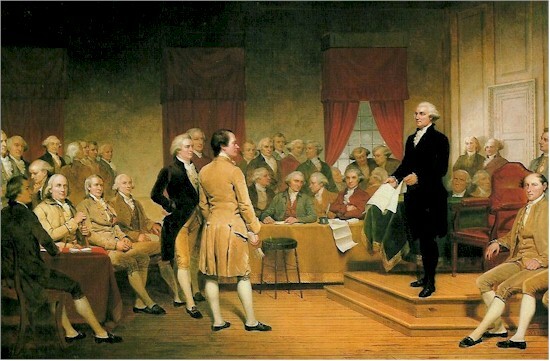 The constraints placed upon government by our Founding Fathers via the Constitution led to the greatest explosion of freedom and prosperity ever witnessed in the history of civilization. The man now occupying the Oval Office believes he has a better idea than did those freedom-loving patriots. This man sees unfairness and danger in liberty, and offers ‘hope and change’ through a massive federal government that controls commerce and constrains all personal liberty and self-determination. Barack Obama pompously refers to himself as a constitutional scholar. More appropriately, he is a mortal enemy of the U.S. Constitution. He studies it as a military planner studies an adversary’s defensive positions in preparation for battle. Analyzing, examining and probing points of weaknesses to the constitutional fortress, he takes adversarial positions on every concept of a free republic. Attack, overwhelm, and overcome is the battle cry for the radical leftist from Chicago. Historically, when Obama wanders off without his handlers he is prone to spout off his real Marxists’ beliefs like the ‘spread the wealth’ comment to Joe the Plumber. Seven years before that, however, he unleashed his pent-up rage from his long-held vendetta against the Constitution, telling a Chicago public station in 2001, that ‘redistributive change is needed.’ This was before he employed handlers, acting coaches, and PR specialists to keep him muzzled when not standing in front of his Teleprompter. Congress has long been complicit with chipping away at the peoples’ rights by overstepping their authority, while at the same time ceding much of its legitimate power to the Executive branch and the bureaucracy. This acquiescence of its constitutional mandates relegates the third branch of government to an insignificant position of buffoonery. They are consigned to entertaining and bowing to the whims of the King like a troupe of court jesters. Obama wants Americans unified around a collective culture and everyone reduced to the lowest common denominator. In other words, he wants a once proud and independent nation on its knees, begging favors and alms from an all-powerful federal government. To achieve the progressives’ dream they must perform revolutionary surgery to remove the healthy tissue from the body politic of America and leave a blob of freedom destroying parasites and collectivists. Barack Obama, the self-proclaimed ‘hope’ of the nation is an instrument of despair, a common despot, and a fraud. He is devoid of any love for our constitutional republic, and determined to still the beating heart of liberty. The Constitution is the guardian of America and the country will surely die without its protection.